for these OICL AO vacancies will be available @www.orientalinsurance.org.in from 18-08-2017 to 15-09-2017. Oriental Insurance AO written exam will be held on 22-09-2017. Selection for this OICL Administrative Officer Jobs Recruitment Notification will be held through Written examination only. Candidates who are qualified Degree in their respective fields they can apply for this Oriental Insurance Administrative officer Jobs. 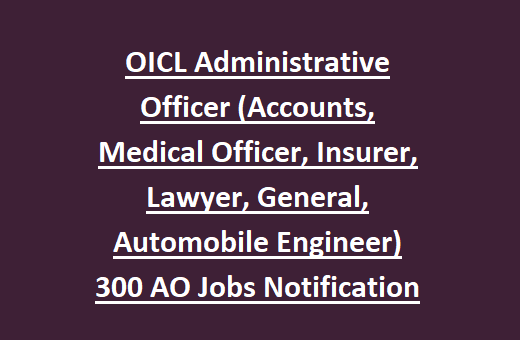 Administrative Officers Jobs in various Fields of Accounts/Medical Officer/Automobile Engineer/Lawyer/Insurer/General Cadres in this OICL Oriental Insurance Recruitment Notification 2017. For more details such as age limits, qualifications and other details refer the below given information. Administrative Officers of OICL Recruitment will be selected on basis of objective type competitive examination only. Post wise separate syllabus will be given. Application fee for AO Jobs of OICL is Rs.600 for General, OBC candidates and Rs.100/- for SC/ST/PWD candidates. Interested and necessary educational qualifications having candidates may apply for this Administrative Jobs of Oriental Insurance Corporation Ltd vacancies on or before 15-09-2017. Admit cards will be available from 17-09-2017. 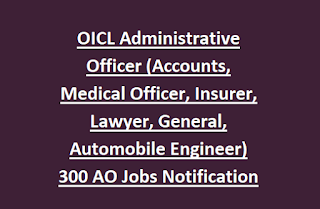 Online applications only acted for this AO jobs of OICL through official website of www.orientalinsurance.org.in. Before applying online read the official notification clearly. Apply Online here for the ORIENTAL INSURANCE OICL Administrative Officer AO Vacancy Recruitment 2017.